The Code 37 error is one of several Device Manager error codes that basically means that the driver installed for the hardware device has failed in some way. Details on Device Manager error codes like Code 37 are available in the Device Status area in the device's properties: How to View a Device's Status in Device Manager. Device Manager error codes are exclusive to Device Manager. If you see the Code 37 error elsewhere in Windows, chances are it's a system error code which you should not troubleshoot as a Device Manager issue. The Code 37 error could apply to any hardware device in Device Manager. However, most Code 37 errors appear on optical drives like Blu-ray, DVD, and CD drives, as well as video cards and USB devices. Any of Microsoft's operating systems could experience a Code 37 Device Manager error including Windows 10, Windows 8, Windows 7, Windows Vista, Windows XP, and more. Restart your computer if you haven't already restarted it at least once after seeing the Code 37 error. It's possible that the error Code 37 you're seeing was caused by a temporary problem with the hardware. If so, a restart of your computer might be all you need to fix the Code 37 error. Did you install a device or make a change in Device Manager just before the Code 37 error appeared? If so, it's highly likely that the change you made caused the Code 37 error. Undo the change if you can, restart your computer, and then check again for the Code 37 error. Delete the UpperFilters and LowerFilters registry values. One common cause of Code 37 errors is the corruption of two registry values in the DVD/CD-ROM Drive Class registry key. Deleting similar values in the Windows Registry could also be the solution to a Code 37 error that appears on a device other than a Blu-ray, DVD, or CD drive. The UpperFilters/LowerFilters tutorial linked above will show you exactly what you need to do. Try a different USB port if the Code 37 error is seen while using a USB device. If you have an old device, it might only work on a slower USB port, in which case — if your computer has both — you can swap the device from a faster port like 3.0, to a slower one like 2.0. Reinstall the driver for the device. Uninstalling and then reinstalling the drivers for the device is another likely solution to a Code 37 error, especially if the error is showing up on a device other than a BD/DVD/CD drive. To do this, open Device Manager and then right-click or tap-and-hold on the device, go into the Driver tab, and then choose Uninstall. When finished, use the Action > Scan for hardware changes option to force Windows to look for new drivers. If a USB device is generating the Code 37 error, uninstall every device under the Universal Serial Bus controllers hardware category in Device Manager as part of the driver reinstall. This includes any USB Mass Storage Device, USB Host Controller, and USB Root Hub. Correctly reinstalling a driver is not the same as simply updating a driver. A full driver reinstall involves completely removing the currently installed driver and then letting Windows install it over again from scratch. 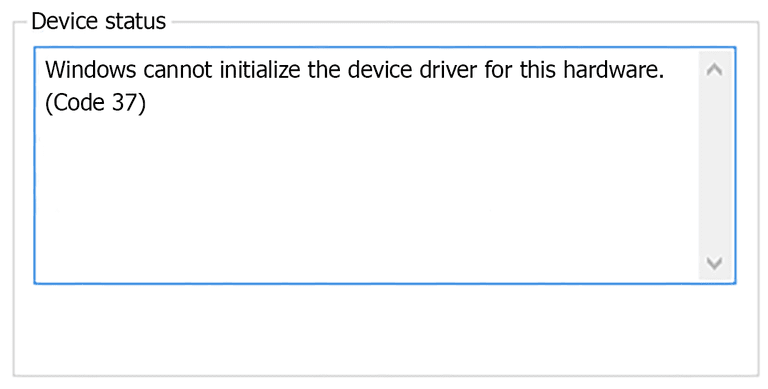 Update the drivers for the device. Installing the latest drivers for a device with the Code 37 error is another possible fix. Be sure that you're installing the appropriate, manufacturer-supplied 64-bit driver for the device if you're using a 64-bit version of Windows. This is always important but not doing so can be the cause of a Code 37 issue, so we wanted to call it out here. See Am I Running a 32-bit or 64-bit Version of Windows? if you need help figuring out what kind of Windows you're running. Run the sfc /scannow System File Checker command to scan for, and replace if necessary, missing or corrupt Windows files. Some users have reported Code 37 issues that couldn't be solved by a driver reinstall but did go away after running the System File Checker tool. This means that at least some Code 37 errors might be caused by issues with Windows itself. Replace the hardware. If none of the previous troubleshooting has worked, you might need to replace the hardware that has the Code 37 error. While not very likely, it is also possible that the device is not compatible with your version of Windows. This might be an issue if the hardware with the Code 37 error was manufactured many years ago or if your hardware is newer but your operating system is more than a version old. You can reference the Windows HCL for compatibility if you think this might apply to you. If you're sure that the hardware itself isn't the cause of this particular Code 37 error, you could try a repair install of Windows and then a clean install of Windows if the repair didn't work. I don't recommend doing either of those before you try replacing the hardware, but they may be your only options left. Please let me know if you've fixed a Code 37 error using a method that I don't have above. I'd like to keep this page as updated as possible. If you're not interested in fixing this Code 37 problem yourself, see How Do I Get My Computer Fixed? for a full list of your support options, plus help with everything along the way like figuring out repair costs, getting your files off, choosing a repair service, and a whole lot more.